TRENTON – For children in Trenton who reach their first birthday, there will be plenty of diapers to go around; over 87,000 to be exact, all due to United Methodist churches in Trenton and throughout Greater New Jersey partnering to collect them for low-income families with babies in the state capital, which has one of the highest infant mortality rates in America. The effort was spearheaded by The Maker’s Place, a new Trenton-based mission initiative of United Methodists in Greater New Jersey. Rev. Michael Reed was appointed to The Maker’s Place in 2018 and put out a call to United Methodists in GNJ to participate in its holiday diaper drive. On December 16, Turning Point UMC in Trenton became the collection depot where volunteers were ready to welcome participants with high-fives and hot drinks. 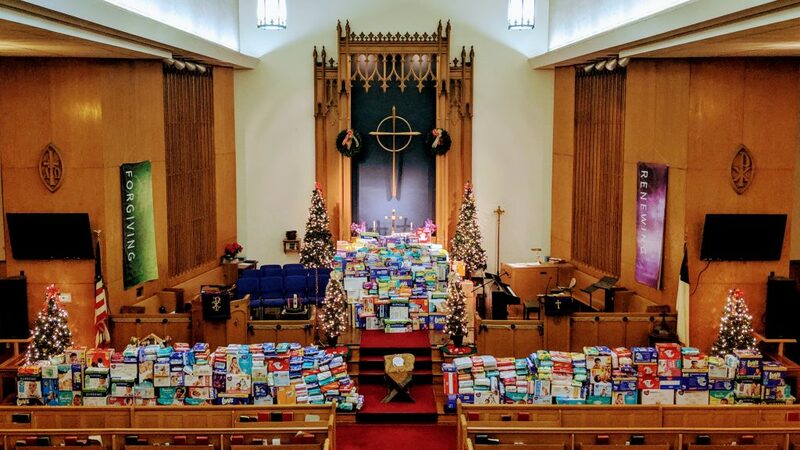 Reed encouraged churches to bless and pray over their diaper collections during services and to pray together as congregations for the mothers and babies who would receive the gifts as well as for the formation of relationships with families through Maker’s Place. When Lucy, a high school student who lives around the corner from Frenchtown UMC, heard about Maker’s Place diaper drive, she started her own, reaching out to friends and neighbors, surpassing her goal of 2,000 diapers. “Diapers connected church and community!” exclaimed Reed. Within days, the word spread and tens of thousands of diapers were collected. From 2,000 to 10,000, the goal kept expanding. Churches, workplaces and friends gathered diapers by the thousands. In total, more than 87,000 diapers were collected with the help of nearly 40 congregations and community groups from across the state. The diapers will be distributed at community birthday parties this year, celebrating one year olds and their families. These ‘First Birthday Parties’ will be sponsored by The Maker’s Place in partnership with The Children’s Home Society of New Jersey, along with community partners and other congregations including African UMC, Turning Point UMC, Trinity UMC in Ewing and Iglesia Metodista Unida Wesley. The parties will also provide resources to reduce Trenton’s high infant mortality rate with the first party being held on March 2 at Turning Point UMC. Reed considers the 87,000 diapers as proof of God’s divine economy of abundance. Trenton is famous for its slogan, “What Trenton Makes. The World Takes.”, which was adapted in 1917 to represent Trenton’s role as a manufacturing center. A few years ago a handful of folks in central New Jersey started to dream about the vision for Maker’s Place: a multiethnic and economically diverse community in Trenton where all people could experience the wide welcome of God, and where United Methodists from across the state could live out God’s love in action. The Maker’s Place has started with initiatives centered around food and families, and in partnership with four United Methodist churches in Trenton, cultivating transformative relationships and helping people build bridges out of poverty. In January, Susan Victor was appointed to join Rev. Reed at The Maker’s Place. Victor serves full-time as the Director of Counseling at Womanspace, a Trenton-area non-profit that works with women, men, and families impacted by domestic and sexual violence. Alongside her work at Womanspace, she is also ordained as a United Methodist Deacon. Princeton UMC has been the context of Victor’s secondary appointment for the past nine years. Pastor Jenny Smith Walz and the congregation are sending Victor to The Maker’s Place with their blessing, and with the intention of building a stronger connection between the new ministry and their church. The Maker’s Place is organizing around a mission of food and families and is looking to establish a more permanent location and flagship ministry this year.